Trunks: Erect; bark black, furrows deep, ridges flat, blocky, plate-like; wood brown, hard. Twigs: Reddish brown to grayish brown, rigid, scurfy or glabrate; leaf scars half-round; pith brown; buds reddish brown, ovoid, .2 to .24 inch, apex acute, scales sparsely rusty-pubescent. Leaves: Deciduous, alternate, simple; petiole .2 to .8 inch, sparsely pubescent; blade broadly obovate-clavate to inversely triangular in outline, 2.8 to 8 inches long, 2.8 to 7.2 inches wide, base rounded to cordate, margins shallowly 3-lobed at apex, occasionally with 2 narrow lobes proximally, terminal 3 lobes broad, sometimes with 1-2 teeth, bristle-tipped, apex obtuse to acute, lower surface brownish green, hairs in fascicles and axillary tufts, upper surface dark yellow-green, shiny, glabrous or sparsely pubescent with hairs in fascicles. Flowers: Staminate catkins at base of new growth, 30-50-flowered, pendent, 2 to 4.8 inches; peduncle .2 to .7 inch; pedicels absent; pistillate spikes axillary from new growth, 1-2-flowered; peduncle 0 to .16 inch; pedicels absent. Flowers unisexual, more or less radially symmetric; staminate: sepals 2-6, connate, calyx lobes .05 to .06 inch; petals absent; stamens 4-6; pistillate: sepals 6, connate, calyx free from ovary; petals absent; pistil 1; styles 3. Fruit: October; acorns, maturing second year; peduncle elongating to .04 to .2 inch; cup top-shaped, .24 to .4 inch × .52 to .7 inch, enclosing 1/3 to 1/2 of nut, scale apices closely appressed; nut yellowish brown, ovoid to nearly spherical, .52 to .67 × .35 to .52 inch, minutely pubescent; seed 1. 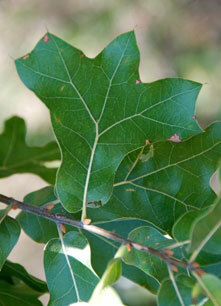 Habitat: Dry, sandy, gravelly, or clayey soil in upland woods, prairies, ridges, and bluffs. Uses: The Choctaw tribe used an infusion of tree bark as an analgesic and gynecological aid, and the Comanche tribe consumed the boiled acorns in times of scarcity. Squirrels, other small mammals, and birds consume the acorns. Comments: Quercus marilandica often grows in mixed stands with Q. stellata.